WASHINGTON — Senate Republicans and Democrats on Tuesday offered the first glimmers of a potential resolution to the five-week partial government shutdown, scheduling procedural votes Thursday on President Trump’s proposal to spend $5.7 billion on a border wall and a competing bill that would fund the government through Feb. 8. The plan for the Senate to consider the dueling proposals reflects the first bipartisan action since the shutdown began on legislation that could end the impasse, offering each party a chance to press its proposal. 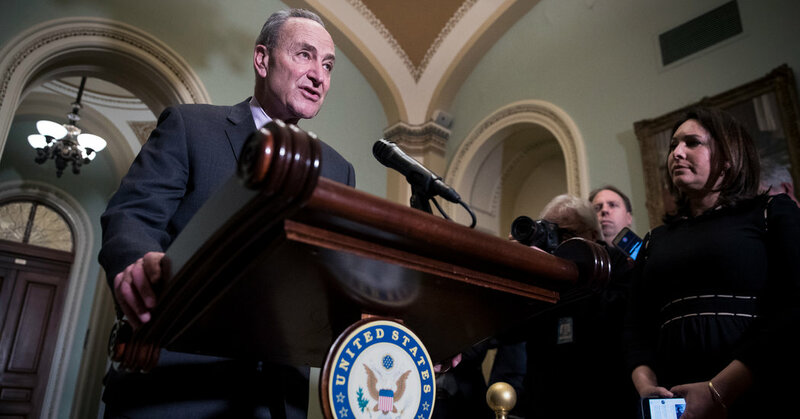 But the move by Senators Mitch McConnell of Kentucky, the majority leader, and Chuck Schumer of New York, the Democratic leader, is far from a guarantee of breaking the gridlock. With most Republicans united behind Mr. Trump’s insistence that any legislation to reopen the government include money for a border wall and most Democrats opposed to the linkage, neither measure is likely to draw the 60 votes required to advance. Mr. Trump’s proposal, which he promoted in a televised address on Saturday as a bipartisan compromise to pair wall funding with temporary legal protections for some immigrants, is facing all but certain death after White House officials conceded privately on Tuesday they had tacked on controversial proposals anathema to Democrats that would block many migrants from seeking asylum. The Republican legislation, unveiled Monday night, would provide $5.7 billion in wall funding and large spending increases for detention and removal of immigrants as well as three-year provisional protections for 700,000 of the young undocumented immigrants known as Dreamers, and about 325,000 immigrants mostly from Latin American countries and Haiti who have been living in the United States under Temporary Protected Status. “It’s a strong proposal, it’s the only thing on the table, and later this week, we’ll vote on it,” he added. But the measure also included several changes to asylum law that would make it more difficult for people to seek refuge from persecution and violence in their home countries. Among them were provisions to bar Central American children from claiming the status inside the United States, requiring them instead to do so in their own countries, and allow any them to be quickly sent back to their own countries. Another revision would create a host of new grounds for deeming an asylum claim “frivolous,” including if the migrant seeking protection was also trying to obtain work authorization, had used a fraudulent document — knowingly or unknowingly — or did not file in a timely way. A senior administration official who insisted on anonymity to describe internal deliberations said on Tuesday that the provisions were added at the behest of the Department of Homeland Security once it became clear that Democrats were going to oppose Mr. Trump’s original proposal. At the same time, Mr. Trump and Speaker Nancy Pelosi remained in a private standoff about whether he should be allowed to deliver his State of the Union address next week, underlining the bitter partisan divide that is fueling the stalemate. A White House official wrote to security officials on Capitol Hill late Sunday requesting a walk-through on Monday to prepare for the speech, in what two aides described as a bid to pressure Ms. Pelosi to issue Mr. Trump a formal invitation. But Monday was a federal holiday, and the meeting never occurred.